Zaatari in Jordan, currently the largest camp for Syrian refugees. There were 1.6 million school-aged refugee children (aged 5–17 years) among the 5 million refugees registered in Turkey, Lebanon, Jordan, Iraq and Egypt by the end of 2016. 1.1 million of those children have had access to either formal education (900,000) or non-formal education (150,000), including over 6,600 Palestine refugee children from Syria. Humanitarian aid during the Syrian Civil War focuses on basic needs, health care, education and providing jobs. Most of the burden remains on the host countries, which face a stressed economy and export disruption, with the additional population, mostly outside of camps, causing significant pressure on public and private (e.g. housing) infrastructure. Within Syria itself, shelter aid for internally displaced persons is coordinated mainly by the Global Shelter Cluster (co-led by UNHCR, IFRC and the Syrian Ministry of Local Administration). However, there is poor accessibility to the areas of need, so efforts were directed at emergency aid. The Shelter Cluster also cites the complexity of administrative procedures and limited capacity of NGOs permitted to operate in Syria as challenges to assistance. In 2016, public buildings were rehabilitated as collective short and mid-term shelters for 24,000 persons. For example, of the 90,000 people from east Aleppo registered by the UN, the vast majority live in houses. The remaining 4,250 individuals live in the Jibrin collective shelter, as of January 2017. Shelter and winterization kits (light construction materials and tools and clothes, blankets, etc.) were distributed to 26,000 people, while 40,000 benefited from private building upgrades. Only recently the situation allowed for implementing more durable solutions that included full, long-term rehabilitation of damaged houses. It also improved basic living conditions, such as light infrastructure repair and legal help. UNRWA estimates that 450,000 Palestinian refugees remain in Syria, of whom up to 280,000 are internally displaced, and an estimated 43,000 are trapped in hard-to-reach locations. Some have been displaced multiple times as a result of armed violence. Additionally, 120,000 are displaced to neighboring countries. Until 2011, UNRWA provided services in 12 camps administered by Syrian authorities, including Homs and Yarmouk. Many sustained extensive damage and were forcibly displaced due to armed conflict. As of January 2017, UNRWA manages 9 shelters with about 2,600 Palestine refugees and provides cash, food and non-food items to many more. Battles between Tahrir al-Sham and ISIL for control of the Yarmouk Camp continue for more than two years, as of April 2017. The Regional Refugee and Resilience Plan (3RP) gives a strategic overview, plans and reports, developed by UNHCR, UNDP and NGOs together with governments of Egypt and countries neighboring Syria which includes Turkey, Jordan, Lebanon, and Iraq. The Israeli government has refused to offer any resettlement places to refugees. A camp near the Syrian border at Suruç, Turkey. In Turkey, the population of Syrian refugees is estimated to be around 3.0 million, with many more who are unregistered, of whom 260,000 live in the 22 camps, as of May 2017. The camps, also known as Temporary Accommodation Centers or Temporary Protection Centers (TPCs), are run by the government-led Disaster and Emergency Management Presidency (AFAD) with the support of the United Nations and NGO partners. A camp with a 20,000-person capacity in the Derik district of Mardin was inaugurated in February 2015; however in 2016, it was emptied due to security concerns. 6,500 refugees were then transferred to other camps. A tent camp was also present in Nusaybin, Mardin, but it was forcibly evacuated and turned into a military headquarters by the Turkish military, according to Kurdish reports; the town has since seen clashes with the PKK. A Turkish NGO reported several Yezidi camps and settlements in southeastern Turkey, including more than 6,000 persons, with UNHCR or other UN agencies not present in the area. They are coordinated by understaffed local Kurdish political structures with scarce resources. 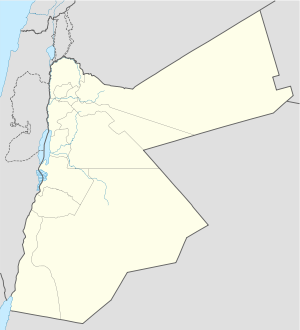 Location of Syrian refugee camps in Jordan. The Jordanian Response Plan 2017-2019 outlines the official approach to the refugee crisis. There were 660,000 refugees in Jordan registered with UNHCR as of May 2017, constituting about 9% of its population. This number included 140,000 people in the three camps managed by UNHCR and the Jordanian government. In an interview with BBC in January 2017, Jordanian Chief of Staff Lieutenant, Mahmoud Freihat, claimed that there are 1 million more unregistered refugees in Jordan. A November 2016 national census showed that there were 1.3 million Syrians residing in the country. The Zaatari camp opened in July 2012 and by 2013 was hosted above 100,000 refugees. The Mrajeeb Al Fhood (April 2013) and Azraq (April 2014) camps were then built to bring Zaatari back to its capacity of 80,000. Zaatari and Azraq are now the two largest Syrian refugee camps. UNHCR reported in January 2017 that only 35,000 of the 54,000 people registered in the Azraq camp were actually present there. At the eastern part of the border with Syria, an area known as "the berm", informal encampents have been reported in Rukban and Hadallat. Human Rights Watch and Amnesty International criticized Jordanian authorities for suspending aid to them and not allowing refugees in. In 2016, according to FSA rebels, Russian warplanes bombed the Hadallat camp, killing at least 12 people. At dawn on 21 June 2016, an ISIL car crossed over from Rukban on Syrian territory and managed to reach a Jordanian army outpost designated for the distribution of humanitarian aid to refugees. The car exploded, killing 6 and injuring 14 Jordanian soldiers. The incident led Jordan to seal off its borders with Syria, as several other incidents followed that targeted refugees on the Syrian side of Rukban. According to government officials in January 2017, ISIL controlled the encampment, so access was blocked because of security concerns over hidden ISIL sleeper cells. Severe water scarcity in Jordan has been aggravated by the increased population. The refugees in Zaatari and Azraq camps must manage with 35 liters of water a day per person, which is about 3 times less than before the conflict. Lebanon hosts about 1.5 million Syrian refugees, which amounts to more than one fourth of the total population, as of February 2017. This is by far the highest number of refugees per capita worldwide. One million refugees are registered with UNHCR, but the figure did not change since 2015, when the government suspended further registration; entering Lebanon has become close to impossible for the remaining Syrian refugees. There were 280,000 Palestinian refugees before the Syrian crisis, 32,000 more fled from Syria. Around 6,000 Iraqi refugees also fled to Lebanon. Additionally, 1-1.5 million Lebanese are in need of humanitarian assistance. Public services and infrastructure are overburdened, exacerbating pre-existing economic and social problems. The Lebanese Crisis Response Plan exposes the official response to the crisis, as developed by the Lebanese government together with the UN and NGOs. About 12% of refugee households live in informal settlements (tents from timber, plastic sheets, etc. ), 17% live in non-residential buildings (worksites, garages, shops), the remaining 71% living in regular apartments, houses, or doorman rooms (micro-apartments). More than a quarter of households are overcrowded (less than 4.5 meters per person). Similarly, many were in poor conditions, with 12% being severely damaged or in risk of collapse and 14% with significant issues such as leaking roofs, damaged plumbing, etc. Refugees pay an average monthly rent of 189 U.S. dollars, including people paying to keep their tent on the land. In addition, 23% have no access to bathrooms. Less than 1% of those refugees have no access to toilets, as 55% used flush latrines and 27% used improved pit latrines. No formal Syrian refugee camps exists in Lebanon. There are 12 pre-existing formal Palestinian refugee camps in Lebanon managed by UNRWA. While the Lebanese, Syrian, and Palestinian communities, as well as responsibilities for them, are to some extent separated, some Syrians nevertheless live in those camps, at least in the short term. However, essentially no estimates of their number are known. Refugee tents at Arbat Transit Camp for Syrian Refugees in Sulaymaniyah, Iraqi Kurdistan, March 2014. There are 240,000 registered Syrian refugees in Iraq, 90,000 of whom reside in camps managed by UNHCR, IRC and the Directorate of Health. All the ten Syrian refugee camps in Iraq are within the Kurdish region. [clarification needed] There are 40 more camps for internally displaced Iraqis. Al Anbar Al-Obaidi 1,500? 1,500? A camp for Syrian Kurds was also present in Moqebleh, near the city of Dohuk, but was moved several years later. The al-Obaidi camp became inaccessible to humanitarian staff from 16 June 2014, the population figure has not been updated since. As of February 2017, 120,000 Syrian refugees and asylum-seekers are registered in Egypt, with 80,000 more from Sudan, Ethiopia and other African countries. In Greece, the refugee camps opened in response to the European migrant crisis host Syrian refugees (54.9% of arrivals) followed by Afghan (24.6%) and Iraqi refugees (11.0%). There are currently 57,042 refugees in Greece, according to data collected in 2016 by The Refugee Crisis Management Coordination Body. ^ "Syria Regional Refugee Response". Refugees Operational Portal. UNHCR. 2017. Retrieved 1 May 2017. ^ a b The Regional Refugee and Resilience Plan (3RP) (2017). Regional Strategic Overview 2016–2017 (PDF) (Report). p. 6. Retrieved 1 May 2017. ^ "ECHO Factsheet – Jordan: Syria Crisis" (PDF). ECHO. January 2017. Retrieved 1 May 2017. ^ "ECHO Factsheet – Turkey: Refugee crisis" (PDF). ECHO. January 2017. Retrieved 1 May 2017. ^ The Regional Refugee and Resilience Plan (3RP) (2017). 2016 Annual Report (PDF) (Report). p. 17. Retrieved 1 May 2017. ^ Sector partners providing urgent aid to the civilians of Aleppo (January 2017). Shelter Sector 2016 Year-End Report (Report). Maha Shaban. Retrieved 1 May 2017. ^ OCHA (4 January 2017). Aleppo Situation Report No. 12 (Report). Retrieved 1 May 2017. ^ "Escalation of violence in Syria claiming Palestine refugee lives and destroying civilian homes". UNRWA. 8 June 2016. Retrieved 1 May 2017. ^ "Syria Crisis and Palestine refugees". UNRWA. Retrieved 1 May 2017. ^ "Syria Regional Crisis – Emergency Appeal 2017" (PDF). UNWRA. Retrieved 1 May 2017. ^ Joscelyn, Thomas (28 April 2017). "Islamic State battles rival jihadists for control of Yarmouk camp in southern Damascus". FDD's Long War Journal. Retrieved 1 May 2017. ^ Batsheva Sobelman (6 September 2016). "One country that won't be taking Syrian refugees: Israel". Los Angeles Times. Retrieved 1 May 2017. ^ "Syria Regional Refugee Response – Turkey". UNHCR. 6 April 2017. Retrieved 1 May 2017. ^ a b "Syrian Refugee Camps and Provincial Breakdown of Syrian Refugees Registered in SE Turkey". data.unhcr.org. UNHCR. 17 March 2017. Retrieved 1 May 2017. ^ "Current Status in AFAD Temporary Protection Centres". AFAD. 12 December 2016. Retrieved 1 May 2017. ^ "Refugee camp in Mardin evacuated". ilkha.com. ILKHA. 23 September 2016. Retrieved 1 May 2017. ^ "Turkish Derik camp turned into nightmare for Syrian refugees". 8 April 2016. Retrieved 1 May 2017. ^ "AFAD camp sheltering Êzîdîs evacuated and occupied by Turkish forces". Kurdish info. Firat News Agency. 4 January 2016. Retrieved 1 May 2017. ^ "Yazidi Refugees in Şırnak, Siirt, Batman and Diyarbakır and the Factors Forcing them to Move to the Bulgarian Border" (PDF). igamder.org. The Research Center on Asylum and Migration (ARCAM) / İltica ve Göç Araştırmaları Merkezi (İGAM). Retrieved 1 May 2017. ^ "Conditions in 11 Yezidi Refugee Camps in Turkey". Kurdistan Tribune. 17 September 2014. Retrieved 1 May 2017. ^ "Syria Regional Refugee Response – Jordan". UNHCR. 1 May 2017. Retrieved 1 May 2017. ^ a b c Jauhiainen, Jussi; Vorobeva, Ekaterina. "Migrants, Asylum Seekers And Refugees In Jordan, 2017". University of Turku. ISBN 978-951-29-7189-3. Retrieved 17 December 2018. ^ a b "External Statistical Report on UNHCR Registered Syrians". UNHCR. 15 April 2017. ^ a b "Jordanian Chief of Staff Lieutenant Mahmoud Freihat: ISIS Controls Syrian Refugee Camps Near Jordanian Border". MEMRI. January 2017. ^ Ghazal, Mohammad (22 January 2016). "Population stands at around 9.5 million, including 2.9 million guests". The Jordan Times. Retrieved 22 January 2016. ^ "Syrian Refugees: Time To Do The Right Thing". Sharnoff's Global Views. 18 August 2013. Retrieved 1 May 2017. ^ "Azraq Camp Factsheet". UNHCR. January 2017. Retrieved 1 May 2017. ^ Al-Khalidi, Suleiman (13 July 2016). "Syrian rebels say Russian jets hit refugee camp along Jordan border". Reuters. Retrieved 1 May 2017. ^ Milbes, Alaa. "Getting water to Zaatari during drought season". Oxfam. Retrieved 1 May 2017. ^ "Syria Regional Refugee Response – Emirati Jordanian Camp". UNHCR. 1 May 2017. Retrieved 1 May 2017. ^ a b "Lebanon Inter-agency Multi Sectoral Statistical Dashboard". Inter-agency Coordination Lebanon. February 2017. Retrieved 1 May 2017. ^ "Lebanon: Syria Crisis Factsheet" (PDF). ECHO. ^ "Vulnerability Assessment of Syrian Refugees in Lebanon 2016". UNICEF, UNHCR, WFP. December 2016. Retrieved 1 May 2017. ^ Venetia, Rainey (11 March 2015). "Lebanon: No formal refugee camps for Syrians". Al Jazeera. Retrieved 1 May 2017. ^ "Lebanon Crisis Response Plan 2017–2020". p. 67. As for the Palestine Refugees in Lebanon and Palestine Refugees from Syria living in camps in Lebanon, the MoEW and EDL have pending claims with UNRWA extending from 2003 until 2014. These claims are currently being handled by the Ministry of Foreign Affairs. As such, MoEW is in no position, thus far, to take into account the demand of these populations within the LCRP. If solutions are reached within the period between 2017 and 2020, the Energy sector strategy under the LCRP will be revisited accordingly. ^ "Lebanon: Syria Crisis Factsheet" (PDF). ECHO. Security along the border areas, particularly in Akkar and the northern Bekaa Valley, make humanitarian access and the delivery of assistance very challenging. Several episodes of violence in the last years have led to more restrictive policies and crystallised tensions between Lebanese and Syrian refugees, including increased evictions and police raids, mistreatment and restrictions of movement. ^ Mackenzie, Laura (14 January 2016). "Shatila's population unknown as Palestinian refugee camp bursts at seams". The National (Abu Dhabi). Retrieved 1 May 2017. ^ a b "3RP/Iraq Humanitarian Inter-Agency Interventions for Syrian Refugees Information Kit no. 16". UNHCR. ^ "Egypt – UNHCR Operational Update Jan-Feb 2017" (PDF). UNHCR. ^ "Nationality of arrivals to Greece, Italy and Spain". UNHCR. 31 March 2016. Retrieved 2 July 2016. ^ "Greece: Europe Refugee Emergency - Daily map indicating capacity and occupancy (Governmental figures) As of 10 June 2016 08:00 a.m. EET". This page was last edited on 16 January 2019, at 09:38 (UTC).